(Larchmont, NY)- Butch Ulmer Interview- enjoy this preliminary insight from a long-time Long Island Sound expert regards the J/109 North American’s at Larchmont, NY. Thanks to SAIL-WORLD.com. “The J/109 was first launched in 2001, and while the boat was never as popular as it’s slightly smaller cousin, the J/105, J/Boats built more than 375 J/109s during its 11-year production run. While only marginally larger than the 105, the 109’s design delivers more headroom and significantly more belowdecks comfort (read: a fully galley and other cruising amenities), while still proving plenty quick around the buoys. The net result is a design that’s both fun to cruise or to race, either in a handicap race or as part of a One Design class, such as the one that will be assembling on the waters of western Long Island Sound, off of Larchmont Yacht Club, in Larchmont, New York, for this year’s J/109 North Americans (October 11-14). 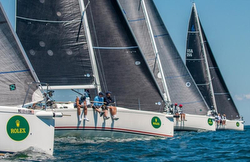 The J/109 class currently enjoys broad geographic distribution across North America, but as with many popular boats, certain areas tend to attract more of a particular design, and the greater Northeast region is home to many of these capable cruiser/racers. Not surprisingly, several of these teams will be representing their clubs at this year’s North Americans. 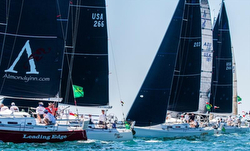 While 2017’s J/109 North Americans were contested on the waters off of Block Island as part of the 2017 Block Island Race Week, this year’s North Americans fleet will be contending with a much more confined racecourse that’s influenced by plenty of current and shore breezes and sporadically punctuated by heavy metal lumbering its way to and from the Big Apple. Still, with the starting guns set to sound in mid-October, there’s a reasonable chance that competing teams will enjoy some nice fall breezes and early onshore colors, compliments of the area’s deciduous trees. I checked in with Butch Ulmer, principal race officer for the 2018 J/109 North Americans, via email, to learn more about this highly competitive One Design regatta. SW: How many boats are you expecting on the starting line? Also, do you expect most of these boats to hail from the East Coast and New England, or do you expect a big geographic reach? Between 20 and 30 boats. Of the 16 boats already entered, only six are from Long Island Sound. Two are from Texas and one is from Annapolis, but yes, in the end, the bulk of the fleet will hail from the northeast U.S.
SW: How would you describe the expected level of competition at the 2018 J/109 North Americans compared to other North American-level regattas that you have been involved with over the years? Hard to say. I used to sail a lot with Rick Lyall on his J/109 Storm and I made it a point to know who the competition was. I recognize a few of the skippers and am sure they’ll be at or near the top each day. I’d say there will be a small group of boats contending right up until the end. Last year, in a considerably larger J/105 Fleet, such was not the case. There was one boat (from out of town) and then the rest of the fleet. SW: Provided that the weather gods cooperate, how many races do you hope to contest at this regatta? Also, will these all be Windward-Leewards? Four days of racing, max number of races is ten. There is one course with two reaches. I will only use this course in light air to get the boats downwind so they can start the second beat. SW: Conditions on Long Island Sound can sometimes get a little frisky in mid-October, especially if a big easterly rolls through…in the ideal world, what kind of conditions can competitors expect? What about in the less-than-ideal world? I wouldn’t presume to guess at the conditions but the likelihood of a strong breeze certainly exists. Last year we saw puffs in the mid-30’s for the last race of the J/105 regatta. Over four days of racing, my guess is we’ll see a little of everything, e.g. some drifting, some good steady southwesters and a northerly after a frontal passage with 30-40 degree shifts. A big easterly is a long shot but it would make for great sailing! SW: From the PRO’s perspective, what will be the biggest challenges to conducting this regatta? Contending with fickle wind conditions is always the biggest challenge here on Long Island Sound. I am a believer that some races don’t deserve to live, but it can be tough to shoot a race in the head particularly if the better sailors are on top anyway. The job is easier if you surround yourself with good sailors and experienced race-committee personnel. I always do that. SW: Anything else that you’d like to add, for the record? Western Long Island Sound is a tough place to sail. The breeze is fickle and very subject to local conditions. We have a six-foot rise and fall of tide so there is plenty of current. The weekend before the North American Championship, Larchmont Yacht Club and The Storm Trysail Club will host the Intercollegiate Offshore Regatta (www.stormtrysailfoundation.org/intercollegiate-regatta) for 40-50 collegiate teams (copy of last year’s program attached). There will be a J/109 class in that event, and I have $20 that says the eventual J/109 North American champ will have sailed in the collegiate event.” Add to Flipboard Magazine.